Industrial Environments Often Require Confined Space Work | Blackwell's Inc.
Because of the nature of our work, we will find ourselves in many industrial environments, many of which have confined work spaces which require special trainings and skills to enter. While most industries have guidelines which follow OSHA’s rules, we require all our associates to not only receive and meet the individual industrial plants’ specific safety requirements, but to meet our own safety standards, which supersede any industrial guidelines yet encountered. Our confined space simulator allows our associates to receive hands-on training in a confined space. 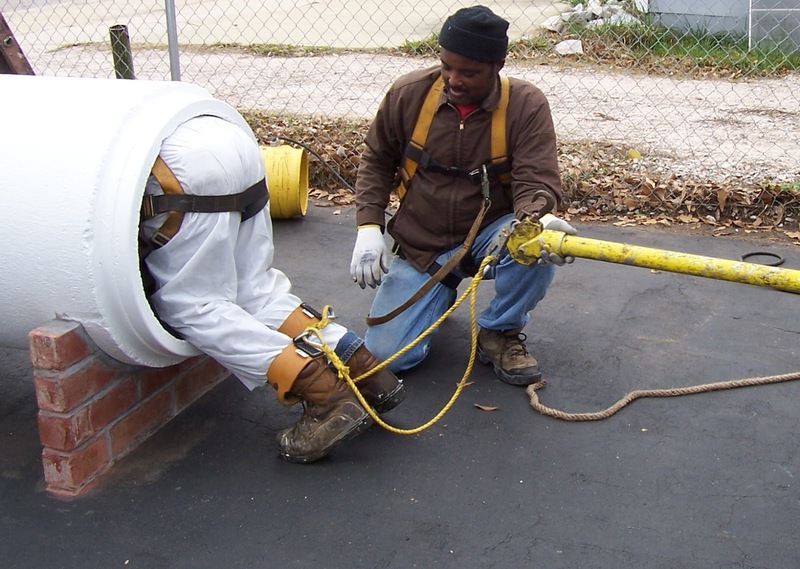 This enables the associate to envision what will be encountered in a confined space, to receive training in the ability to recognize and avoid confined space hazards, to use the equipment commonly used in confined spaces, and the emergency rescue procedures to be followed. A Blackwell's associate inside an 80 foot tall silo. Our goal is to produce first quality and safe work with zero accidents throughout the year.With an average of 25 associates and nearly 50,000 hours worked on a yearly basis, it is very evident from our OSHA Log, that our associates practice safety daily. It takes effort and dedication, but we are within a month of our goal of 1000 days without a work related injury.